I love this time of year when the last of the summer tomatoes hang on their vines. Where there were many only a few remain. Easily picked with very little resistance, these tomatoes are perfectly ripe, beautiful in color, and naturally sweet from long days of being left uninterrupted basking in the warmth of the sun. The two basil plants living on my deck have had its leaves picked all summer with very few new ones growing. Instead I have long empty stems standing like naked autumn tree branches. These basil plants have done a remarkable job feeding my family through the summer adding depth of spiced flavor in contrast to the many bowls of cut sweet fruit and enriched pasta we’ve enjoyed. Now is the time to enjoy these last summer tomatoes to make this salad. 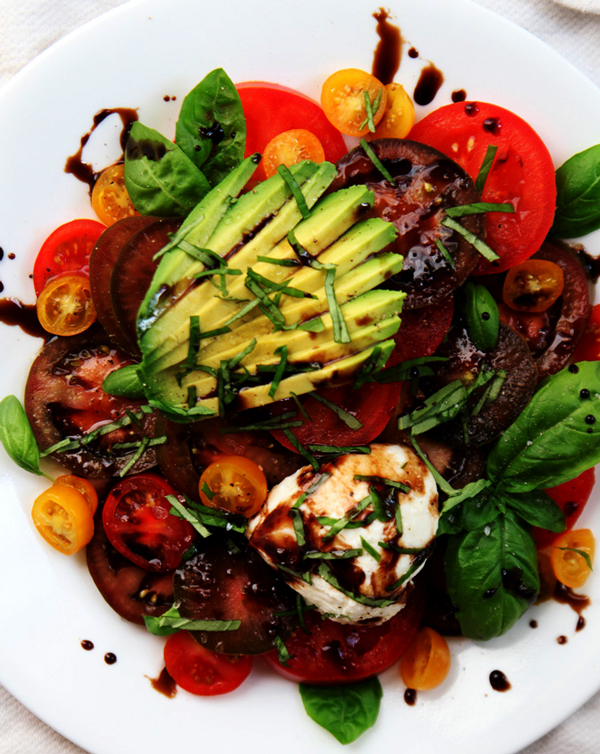 Topped with fresh mozzarella and avocado, this beautiful salad celebrates the end of a wonderful summer. According to the weather forecast, it is suppose to be nearly 80 degrees F. in Seattle this weekend. With summer-like weather, I can’t think of a better dish to finish off the rest of our home grown tomatoes and basil before they are gone. 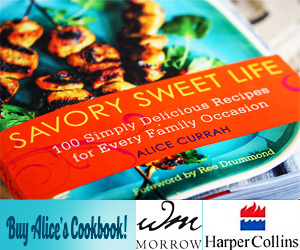 Find the full recipe over at Alice's PBS Parents food column here. Great simple salad. We’ve made this salad dozens of times. We’ve modified it many times adding feta or blue cheese, cucumber, and even olives to it. Also diced chicken, pork, and steak too, it’s awesome with the balsamic vinegar. Love the colors in that salad. Quite different from how we Indians make our salad. Beautiful and fresh – this is exactly why I can never stop living, cooking and eating in the Mediterranean. I did a tomato menu at my supper club (www.papaserra.com) last month and it was a hit – the perfect ingredient imo.